Louis Dennis has picked up the latest Checkatrade Trophy player of the round award following his performance in Pompey’s win over Southend United. The former Bromley forward, who made his league debut in Saturday’s 2-1 defeat at the hands of Oxford United, scored one and set up another as the Blues secured a 2-0 third-round win at Roots Hall. Dennis said: ‘I’m delighted to win this award, we had a good team performance against Southend, and I was happy to play my part in us getting a positive result. ‘A huge thank you to all of the Portsmouth supporters who voted for me. The Blues play Peterborough in the quarter-final of the Checkatrade Trophy tonight at Fratton Park (7pm). 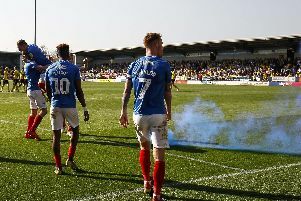 Dennis, who set up Brett Pitman for his goal at the Kassam Stadium at the weekend, is expected to be involved from the start after featuring for Pompey in their past four games in the competition.